MIS student Andrew Douglass is impressing the startup community across the nation and bringing his passion to Bauer and Houston. Bauer College student Andrew Douglass believes there is much to be learned from the startup culture of Kansas City, where Google’s new superfast Internet connection is transforming the landscape of high-tech startups. A management information systems (MIS) major in the University of Houston C. T. Bauer College of Business, Douglass was invited to participate in “Hacking the Gigabit City,” an event sponsored by Mozilla, the National Science Foundation, KC Digital Drive and the Kauffman Foundation. During the all-expenses-paid weekend March 22-24, the accomplished Bauer senior worked on a new app for urban planners. He also stayed in one of the homes for hackers that has popped up in the so-called Silicon Prairie, where a new generation of tech-savvy entrepreneurs are taking advantage of the high-speed fiber-optic network Google Fiber. “The point of that whole hackathon was to try and think of practical applications for consumers that actually have fiber-optic Internet at their house,” said Douglass, the student director of operations at RED Labs, the new startup accelerator housed in Bauer College that serves the UH community. While the 23-year-old Sugar Land native believes there is plenty of tech talent in the city, he thinks independent types gets siphoned off by the oil-and-gas industry, the consulting business and the city of Austin, which just so happens to be the next market for Google Fiber. He is so smitten with the Kansas City landscape that he has considered moving there. Though Douglass enrolled at UH as a computer science major, he quickly gravitated toward Bauer, where programs like 3 Day Startup and RED Labs offer a supportive community and bring MIS and entrepreneurship students together. Since then, his professors say, he has emerged as a hard-working, behind-the-scenes lynchpin of the campus startup movement. As RED Labs’ student director of operations, Douglass’ has a varied list of official and unofficial duties. He goes out for food for the goup’s Wednesday night networking and mentoring sessions. He’s working on RED Labs’ new web site. And he’s around to help startups with questions about design and web development. 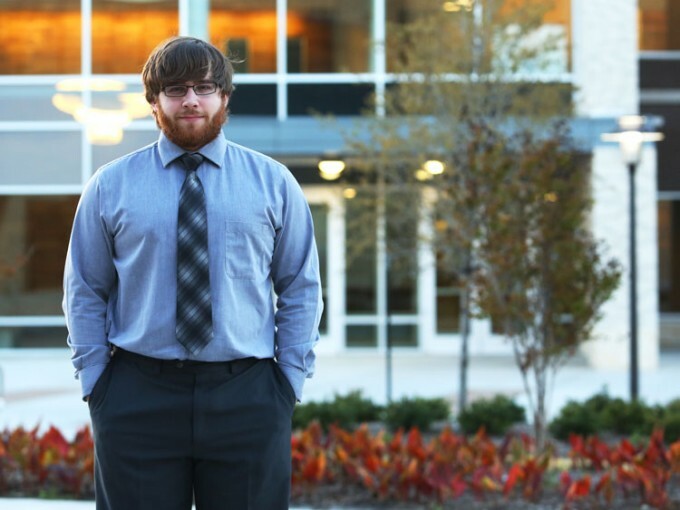 Meanwhile, his facility with web design was sufficient enough to impress the WordPress community, which recently named him the winner of a $2,500 Houston WordPress Scholarship. Meanwhile, Douglass can’t seem to get enough of Kansas City. The weekend after UH 3 Day Startup, he and his girlfriend, Deborah Soetandio, a Bauer student pursuing a double major in MIS and accounting, drove to the city for Hack of the Sexes. They crashed with his buddies at Handprint, and their Hack of the Sexes project, Bus Stamp, was named best emerging idea. Bus Stamp lets public-transportation users who don’t have smart phones retrieve wait times via text messaging. He would like to see the project evolve so that metro riders “who don’t necessarily have the Internet in their pocket” could use it to access additional information — such as directions, restaurant and entertainment options and taxis. “We plan on taking it to the Houston Hackathon (May 17-18), where we will probably have a team of about eight people working on the development, testing and gathering data to prove it’s actually an important problem that needs solving,” Douglass said. As the winner of Hack of the Sexes’ best emerging idea honor, Douglass and Soetandio won a spot in the KC version of 1 Million Cups, as well as some free consulting time from the Polsinelli law firm. Douglass says he’s not sure if they will make it back to Kansas City for 1 Million Cups, but he is intrigued by the city. Newspring is the sponsor organization of 1 Million Cups in Houston. We meet every Wednesday at Teeba’s Cafe, 1330 Wirt Rd. at Westview, 77055 at 9:00 am. It’s free and open to all entrepreneurs and small business owners to attend and present their companies. For more information contact me at sherri@charrin.com.